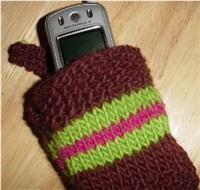 High tech meets homemade practicality – this knitted cell phone cover protects the phone from bumps and scratches, and makes it easier to see when the phone is nestled in your purse. Slip a large bead onto yarn or embroidery floss. Attach to the RS at the end of the strap. To make hole, spread the stitches and push bead through the WS of the front panel. It might feel tight at first, but a buttonhole will reveal itself after a few push throughs.